Datuk Ir. A Rahim Hj Hashim was appointed as the Vice-Chancellor of the Universiti of Malaya on November 1, 2017. He graduated in Electrical and Electronics Engineering from the University of Birmingham, United Kingdom in 1976 and later received an Honorary Doctorate in Engineering from the same university in 2006. He worked for PETRONAS for 32 years from September 1976 to December 2008 and held some important and key positions. These include as MD/CEO of PETRONAS Penapisan Melaka and Malaysian Refining Company (1991-1998), Vice President of Human Resource Management (1998-2002), Vice President of Gas Business (2002-2006) and Vice President Research and Technology (2006-2008). He was also the Technical Manager (1982-1987) and Refinery Manager (1987 – 1988) for PETRONAS Penapisan (Terengganu) Sdn Bhd, the PETRONAS first refinery at Kerteh. 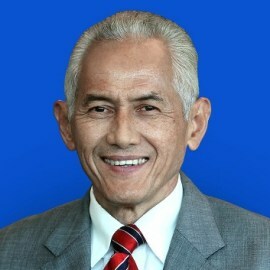 As a professional engineer, he sat on the Board of Engineers Malaysia and was Chairman of the Engineering Accreditation Council of Malaysia (2007-2012). He is currently an Advisor of Institute of Materials Malaysia, a Fellow and a Council Member of the Academy of Sciences Malaysia, a member of the Board of Engineers National Monitoring Committee, a board member of ICE Petroleum Engineering Sdn. Bhd., a board member of Deleum Berhad (a public listed company) and a Board Member of Malaysia Convention & Exhibition Bureau MyCEB’s (MyCEB). In October 2016 he was admitted as a William Pitt Fellow by the Pembroke College of Cambridge. He is the Past President of the International Gas Union (2009-2012), the Immediate Past President of the Malaysian Gas Association (2003-2015) and Past President of the Asia Pacific Natural Gas Vehicle Association (2003-2009). He attended the Harvard Advance Management Program in 1997.